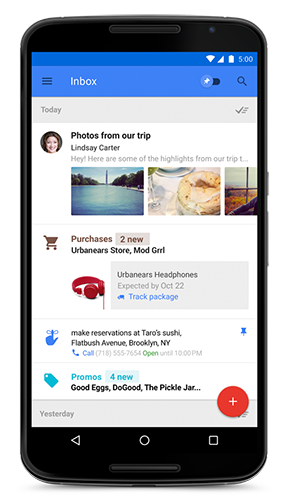 Today Google announced a new Gmail related product that has been years in the making. It's called Inbox, and it's a re-imagining of the email inbox to adapt to the changes in how email is used that have occurred over the past few decades. With email becoming more prominent, and increasingly focused on sending media as well as text, there have always been initiatives to better adapt the email inbox to these changes. Last year Google introduced categories to the Gmail inbox which sorts emails into different sections such as Social emails, Promotions, and Updates. Inbox expands upon these concepts to better organize your mail. Bundles are a new feature within Inbox that expand upon categories by grouping emails into specific groups. For example, all purchase receipts and financial statements are grouped together so they can be easily found and navigated. Inbox can also group emails based on ways you specify. Highlights is a feature that grabs the relevant information from emails and presents it in an easily readable manner. Google claims Inbox will even add additional information not explicitly stated in emails like package tracking status or flight times. Reminders allows the user to set reminders from within the app, and Assists are cards that Google will bring up with information that may help a user complete a task they have reminded themselves to do. These can also be snoozed if they come up at an inconvenient time. Inbox is currently in a closed beta, and Google is already sending out the first round of invitations to users. Users who are invited will be able to invite their friends to join the beta program as well. Users can also email inbox@google.com to get invites as soon as the next wave becomes available. Google has put together a video explaining the features and benefits of Inbox, which has been embedded below. Not sure if that was an ad for a new app or a hipster tutorial. It's currently invite-only, and I imagine they won't force people to use it once it's gone public. I just make an effort to unsubscribe or not sign up for things in the first place. Honestly, calling it an effort is overstating it. I never get unwanted email and I can manually manage the emails that I do get. I'm glad to hear you have your email all organized. But you could imagine a case where another person, not you just to be clear, does not have it worked out so well. Maybe they use their email in a different way that you, so that the influx of emails do require some effort to keep track of. Or maybe they use their email for team collaboration, tracking tasks, etc. well, if they were serious about forcing this onto people, won't they have just made this the next major update for Gmail? I use gmail, but not sure about this. About Google forcing the issue......Google forcing people to sign up for Google + to make an app review on the play store is an example. No "opting out" on that one.